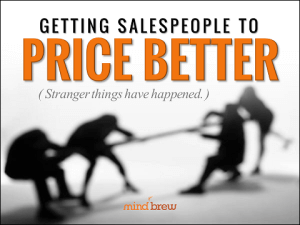 How salespeople often react to pricing and the positives and negatives associated with this dynamic. The motivations and mindsets of different salespeople---what makes them tick, their strengths, and their weaknesses. Ways to modify your own behaviors, actions, and understandings to be more effective in your interactions with sales. How to view and improve the underlying systems and processes that influence the actions of the entire sales force. Driving sales effectiveness and efficiency at-scale can be messy. In this on-demand webinar, glean insights from seven cautionary case studies so you don't repeat the same mistakes and miscalculations.